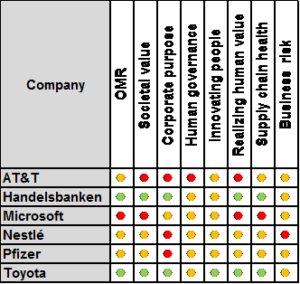 How well do these corporations create best value for citizens, customers, employees and shareholders? “Long-term value creation requires effective management of three forms of capital: financial, physical and human. Strong Governance, along with the effective management of environmental and human capital factors, increases the likelihood that companies will perform over the long-term and manage risk effectively.” CalPERS, April 2016. Societal value: Mature organizations put society’s interests first, knowing that is the only way to maximise value for all stakeholders in the long-term. Human Governance: The quality and capability of board, leadership and senior management (in terms of human governance and human capital management) to manage material value and risk. Innovating people: How many ideas does the company generate from its human capital? One idea per person per year equals 100%. MI exemplar Toyota regularly achieves 500%+. Supply chain health: the extent to which partner organisations are strategically and systemically integrated in a harmonious relationship to generate value (OCRQ) and avoid operational risk. 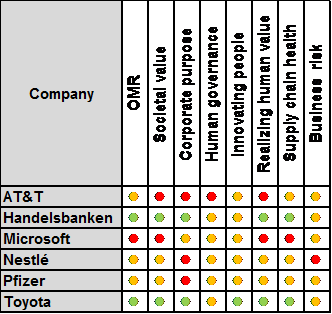 If you want to know your company’s rating, or those for a specific group of companies and how they compare against our HG Scorecard please contact Stuart Woollard.